The theme of this blog was supposed to be marine science, so please forgive me for posting a few snapshots from my time off on the South Island, New Zealand. I had originally planned to have four days of leisure, which got prolonged to ten days due to the late arrival of Araon. I have really enjoyed my time here, scenic views and unspoilt nature everywhere and very friendly people. The last few days have been spent in Christchurch sorting out the last things before departure. 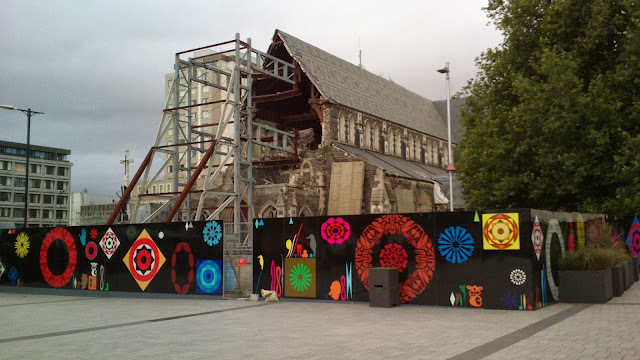 The second city of New Zealand was hit hard by two devastating earthquakes on Sep 4th 2010 and Feb 21st 2011, the latter responsible for the most destruction. The city is far from rebuilt with heaps of rubble, scaffolding and containers in many parts. Many of the temporary arrangements are done in a pretty cool artistic and funky manner. We have had some trouble with the delivery of our equipment, which has not shown up on time. But all our stuff is now in Christchurch and should be in the harbour of Lyttleton tomorrow. There has also been time to check out Araon, which is now at the dock in Lyttleton. It seems to be a very fine ship, with lots of equipment and spacious areas designated to science. We are all looking forward to set off on our trip, but are also a bit worried if we will be able to run the washing machine. Departure is now set to 12.00 on Dec 24th. Seems like your forced vacation was a good one. God Jul!